Open Space Technology (OST) has been called meeting methodology, organization transformation, intentional self-organization and surfing the chaos. Since Harrison Owen described it, more than 30 years ago, it has enabled all kinds of people, in every kind of organization and community, to create inspired meetings and events - and to post phenomenal business results. It has also become clear that opening space, the intentional practice of Inviting Leadership, can create inspired organizations, where ordinary people work together to create extraordinary results with regularity. This seems to happen even, and especially, in large, complex, diverse and potentially conflicted organizations when real results on critical issues must be delivered NOW -- if not sooner. This page contains all kinds of stories about how you can practice OpenSpaceTechnology. These things have been created and collected over 20+ years of practice, especially in the first half of those years, when I was learning and teaching it most actively. It starts with more general pieces about open space. Below that is my open PracticeNotebook, with lots of how to notes, details and adaptations. 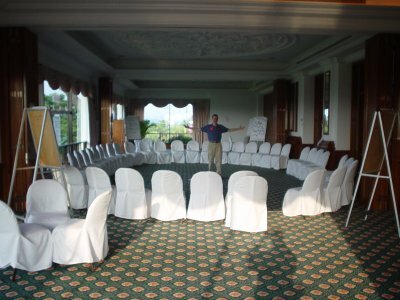 Inviting Leadership in Open Space: A Training and Practice Guide (pdf) - All of my best, most frequently shared resources. This covers everything from origin and evolution to checklist and script, including 2016 updates to many of the original pieces linked below. See [Publications] for more. I also founded and still manage [OpenSpaceWorld.org], from where you might want to find your way into local and global practice communities. If you find any of these things useful, please contact me. I'll be glad to hear from you. Thank you. And CopyRight. Where to Meet OST Friends and Practitioners? /OSLIST - worldwide email community and 24/7 helpline, new people welcome! Lots of nitty-gritty, hot-to details, variations, adaptations, innovations, and alternative views captured here as they've come up over the last many years. Some of these bits will help you write an invitation or manage logistics, others will help you better understand how to stand and breathe and think and support in the middle of Open Space. ProceedingsAlternatives - painting, photo etc. AgileXpUniverseFacilitatorNotes - program summary from a hybrid ost/traditional conference design... which was great! see also /FrequentlyToldStories and /PastProjects? PeoriaSchoolsStory - the future of education in peoria, june 2002, DaveKoehler? RiverTrailsSeventhGrade - what happens when 200 seventh graders dive into open space?